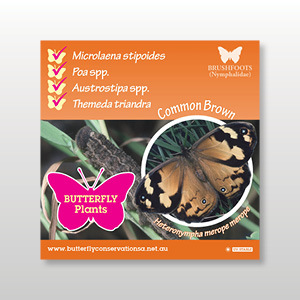 Plant tag for Common Brown (Heteronympha merope merope). Includes plastic stake. NB as of 9/4/18 we have been made aware that these plant tags can fade with long exposure to direct sunlight and are not UV stable. We are in the process of reprinting these tags with UV stable ink to ensure they are durable.